A piano arrangement of the tune Londonderry Air. "Danny Boy" is a ballad written by English songwriter Frederic Weatherly and usually set to the Irish tune of the "Londonderry Air". It is most closely associated with Irish communities. Initially written to a tune other than "Londonderry Air", the words to "Danny Boy" were penned by English lawyer and lyricist Frederic Weatherly in Bath, Somerset in 1910. 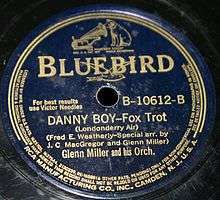 After his Irish-born sister-in-law Margaret (known as Jess) in the United States sent him a copy of "Londonderry Air" in 1913 (an alternative version has her singing the air to him in 1912 with different lyrics), Weatherly modified the lyrics of "Danny Boy" to fit the rhyme and meter of "Londonderry Air". And kneel and say an "Avé" there for me. and I will sleep in peace until you come to me! There are various theories as to the true meaning of "Danny Boy". Some have interpreted the song to be a message from a parent to a son going off to war or leaving as part of the Irish diaspora. The 1918 version of the sheet music included alternative lyrics ("Eily Dear"), with the instructions that "when sung by a man, the words in italic should be used; the song then becomes "Eily Dear", so that "Danny Boy" is only to be sung by a lady". In spite of this, it is unclear whether this was Weatherly's intent. Indeeed, the song has been covered by a diverse range of male singers, including Mario Lanza, Bing Crosby, Andy Williams, Johnny Cash, Elvis Presley, Jackie Wilson, Daniel O'Donnell, Harry Belafonte, Tom Jones and Harry Connick Jr amongst many others, all using the original lyrics. "Danny Boy" is considered to be an unofficial signature song and anthem, particularly by Irish Americans and Irish Canadians. Characters on 30 Rock occasionally sing or play the song, typically in jokes about Irish American culture or drinking. In the Courage the Cowardly Dog episode "The Magic Tree of Nowhere", Courage creates an eel monster that sings lyrics from "Danny Boy". In the Futurama episode "A Pharaoh to Remember", Dr. Zoidberg sings it at a fake funeral for Bender. A big band version of the song is used as the theme for The Danny Thomas Show (a.k.a. Make Room for Daddy). On November 25, 2014, the Vancouver Canucks used the song in honour of the recently deceased Pat Quinn, who played and worked in many executive capacities for the team. In the Modern Family episode "Regrets Only", Jay Pritchett sings this song on a karaoke machine. On April 13, 2013, a South Korean girl group Girls' Generation released the concert album of the 2011 Girls' Generation Asia Tour album. Girls' Generation sang the song on CD 2, track number 7. 1961 (1961) Jim Reeves The Blizzard/Danny Boy 7" 45rpm vinyl LP Released as 45rpm vinyl LP which only contained two songs. 1962 (1962) Connie Francis ""Connie Francis Sings Irish Favorites" Released as an all-Irish album. 1972 (1972) Roy Orbison ""Memphis (album)"
↑ "The 'Danny Boy' Trivia Collection". Standingstones.com. Retrieved 2016-08-29. 1 2 "Fred Weatherly's own description of writing Danny Boy". Retrieved 2010-03-09. 1 2 "The true meaning of Danny Boy". Standingstones.com. Retrieved 2010-03-09. ↑ McCourt, Malachy (30 Mar 2005). Danny Boy: The Legend of the Beloved Irish Ballad (Reprint ed.). New American Library. p. 128. ISBN 0-451-20806-4. ↑ Hinnesbusch, Patricia D. "Irish Song Danny Boy Meaning and History of Irish Ballads." Symbol Meaning for Hundreds of Symbols & Symbol Resources. Living Arts Enterprises, LLC, 14 Sept. 2010. ↑ " Danny Boy (2011 Girls' Generation Tour)". Youtube.com. 2012-12-19. Retrieved 2016-03-12. ↑ "Danny Boy (Londonderry Air) (song by The Glenn Miller Orchestra) ••• Music VF, US & UK hits charts". Musicvf.com. Retrieved 2016-08-29. ↑ "Danny Boy (song by Al Hibbler) ••• Music VF, US & UK hits charts". Musicvf.com. Retrieved 2016-08-29. ↑ "Ruby Murray – The Voice Of Ireland". Discogs. Discogs. Retrieved June 19, 2016. ↑ "Danny Boy (song by Conway Twitty) ••• Music VF, US & UK hits charts". Musicvf.com. 1959-09-28. Retrieved 2016-08-29. ↑ "Archived copy". Archived from the original on 2012-01-21. Retrieved 2013-08-14. ↑ "HPI - Settimana del 26/03/60". Hitparadeitalia.it. 2007-03-25. Retrieved 2016-08-29. ↑ Leigh, Spencer (2008). This Record Is Not to Be Broadcast Vol. 2: 50 More Records Banned by the BBC (liner notes). Fantastic Voyage. FVDD 038. ↑ "Danny Boy (song by Andy Williams) • Music VF, US & UK hits charts". Musicvf.com. 1961-10-30. Retrieved 2016-08-29. ↑ "Danny Boy (song by Patti LaBelle & the Bluebelles) ••• Music VF, US & UK hits charts". Musicvf.com. 1964-12-19. Retrieved 2016-08-29. ↑ "Danny Boy (song by Jackie Wilson) ••• Music VF, US & UK hits charts". Musicvf.com. 1965-02-27. Retrieved 2016-08-29. ↑ "Danny Boy (song by Ray Price) ••• Music VF, US & UK hits charts". Musicvf.com. 1967-03-25. Retrieved 2016-08-29.